One emerging trend on the internal mailing list has been a steadily growing number of threads about robots – covering both big mechanical things, and also more domestic models, and even (as in the case of Barbie below), barely-bots. Time to start gathering those up! It’s more than just a doll because it’s a sensing object, albeit not a very smart one. Still make it walk and you’d have something not unlike a telepresence robot for kids. Autom also uses social cues to seem more lifelike, a big psychological difference from working with a static computer screen. She blinks her eyes, turns to look at who she’s talking to, and ends conversations by saying, “I hope we can talk again about your progress,” in a female voice. 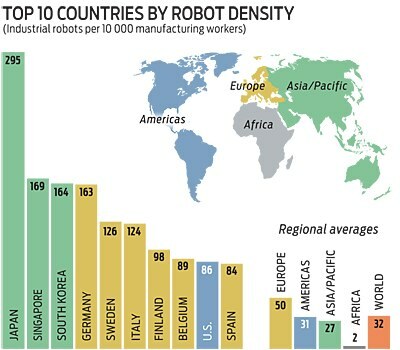 From the end of 2008, it’s a map of the top 10 countries of the world by Robot Population Density, as part of this IEEE Spectrum article. Of course, it’s very specifically talking about industrial robots, but it’s an eye-opening set of figures nontheless. And finally, some fictional robots – namely, this gorgeous set of illustrations for a Russian children’s book from 1979, entitled Your Name? Robot.